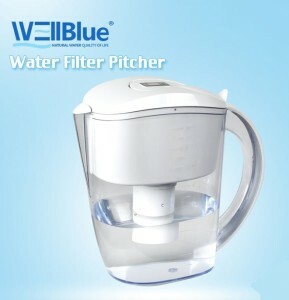 Introducing the Alkaline Plus Water Ionizing Pitcher, by WellBlue! The Alkaline Plus PH Ionizer Pitcher by WellBlue is the best portable water ionizer pitcher we’ve found. I’ve tested this pitcher for the past several months, and it is still testing great after about 60 or so filtrations. It’s supposed to last for 3 months of use, and I’m doing my due-diligence to see if that is a reasonable expectation. Right now I’ll say that it’s at least reasonable to expect it to last for two months of use [about 60 gallons]. I have found it works best if you limit it to 1-2 gallons per day, and suggest if you want to filter more than that, you should buy two of them! What I have found is that when you filter too much in a day, in other words if you use it constantly…every hour filtering a full pitcher, then it tends to dilute, and the results are lowered. The Alkaline Plus PH Pitcher’s Filter Needs Rest Between Filtrations. If you filter about 1.5 quarts/liters then wait 2-3 hours then filter again, that will assure you that you are getting the best results. Therefore, I do not suggest sharing one pitcher between more than two people. However, here’s what I do suggest: use two pitchers alternately with each other, so that more time between filtrations can be achieved. Below is my introductory demo video showing that the Well-Blue water ionizer pitcher is able to change my 9.4 pH, St. Louis water to 10.6 pH and the ORP was better than -500. Depending on how much use it gets in the day I’ve seen the ORP range from about -200 to -550 ORP. That’s why I say get 2 pitchers [to give the other one a break between pourings so the ionization doesn’t fall off]. For additional info: after two months of testing the same filter that was shown in this video it was still able to get 10.4 pH and -300 ORP in St. Louis water. I’ve never seen a portable water ionizer pitcher get these results…even when NEW! I have found that the Well-Blue portable ionizer is better than the competition [such as H2go, Ty-Go, and Alkapod, Nano Alkaline Energy Flask, Alkaline Nano Flask, Alkaline Nano Portable Energy Cup, Suniwater, AOK, etc.]. I’ve also tested it against various other portable pH pitchers and devices, such as the hydrogen stick, and proven beyond any shadow of a doubt how useless the hydrogen stick is. I have for years seen how much better the H2Go did in comparison to the Hydrogen Stick, now with this Well-Blue pitcher I’d say the Well-Blue ionizing pitcher is four times better than the H2Go [in both durability of the filter and amount of filtration for each use]. If the WellBlue Water Ionizer Pitcher is So Great, Why Do You Need a Regular Water Ionizer? A regular water ionizer [if it’s a good one…see the ones I sell] will give you twice the antioxidants of the WellBlue pitcher. See my testimonial for my take on why antioxidants are so important to have in abundance in ionized water. It will also filter the water better. You can continue to use it all day long, and do not need to wait between filtrations. A regular water ionizer will last for 15 or 20 years and most have lifetime warranties. Produces Negative ORP [as strong as -400], transforming regular water into antioxidant water. Active carbon removes chlorine, organic impurities, odor and many other chemicals. Softens the tap water: Ion exchange resin remove hardness [Ca+,Mg+]. Reduces heavy metals: The filter permanently absorbs metals, such as lead, copper and aluminum, so your drinking water will be cleaner. Contains alkalinizing minerals which will help you alkalize your body. See more about our portable water ionizers and filters.